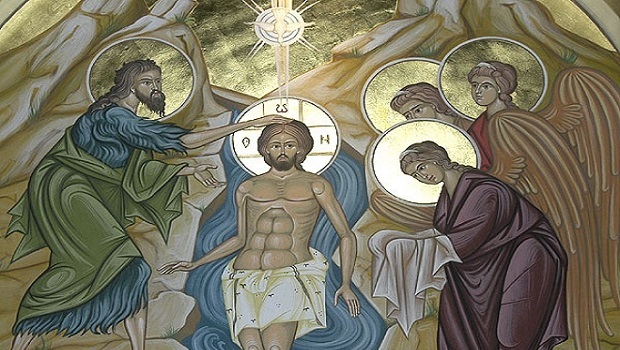 On 6 January, our Church celebrates Theophany, one of the great feasts of the Lord. Jesus’ baptism is the event which formally confirmed the advent of the Messiah. Although the Lord Himself had no need of the remission of sins, He nevertheless came to John ‘to be baptized by him and to fulfil all righteousness’ (Matth. 3, 13-15). As regards Jesus, the Gospel stresses that, as soon as He entered the waters of the river ‘he at once arose from the water’ (Matth. 3, 16) or ‘arising at once from the water’ (Mark 1, 10), an obvious contrast with the other baptisms performed by John, which went on a long time because of the confession involved. The baptism of Jesus was directly linked to the salvation of the world. Jesus was without sin, but became the ‘lamb of God’ and took upon Himself all our sins (Jn. 1, 29, and 1, 36). So the baptism in the Jordan is a model for the other baptism of Christ, His death on the Cross (Mark, 10, 38 and Luke 12, 50), through which not only were sins remitted but the world was redeemed. Through His baptism, Christ sanctifies the world and gives people the opportunity to return to the paradise which Adam lost. According to the vigil for Theophany, after the blessing of the waters and Holy Communion, catechumens were baptized. It was the feast of ‘enlightenment’ for the Christians. Besides, the triple immersion in the water at baptism symbolizes the three-day sojourn of Christ in Hades and the victory of life over death. Let’s look at some of the facts related to the feast of Theophany, which was actually celebrated at the same time as Christmas in the early years of Christianity. From the third century, the feasts began to be separated, first in the East and later in the West. On 6 January, the pagans in Egypt and Arabia celebrated the winter solstice, according to the old calendar. Saint Paul talks about the ‘manifestation of the glory of the great God’ (Titus 2, 13). Elsewhere he states that, through Christ, ‘appeared the grace of God which saves all people’ (Titus 2,11). He also talks about God Who ‘appeared in the flesh’ (1 Tim. 3, 16). Behind these expressions of the Apostle of the Gentiles, we recognize the terms familiar to the pagans: ‘theophany’ and ‘epiphany’, which meant the appearance of the god/emperor to people in some city or other. In contrast to the worship of the sun which defeats darkness at the winter solstice, Christianity presents the worship of the Sun of Righteousness which has risen, according to the Prophet Isaiah: ‘Land of Zebulun and land of Naphtali, the Way of the Sea, beyond the Jordan, Galilee of the Gentiles, the people living in darkness have seen a great light; on those living in the land of the shadow of death a light has dawned (Matth. 4, 15-16, cf. Is. 9, 1-2). The appearance of all three of the Holy Trinity at the time of the baptism is testimony to the beginning of the mission of the Incarnate Word in the world. The voice of the Father and the presence of the Holy Spirit are proof of the undivided, consubstantial and everlasting Divinity. We can speak here of a unique incarnation of the Holy Trinity, since the Son is baptized as a human person, the Father appears as a voice and the Spirit takes on flesh in order to sanctify this. Indeed, He assumes the form of a dove, honouring the flesh and also the symbolism of the fact that the bird in question is the bearer of glad tidings.